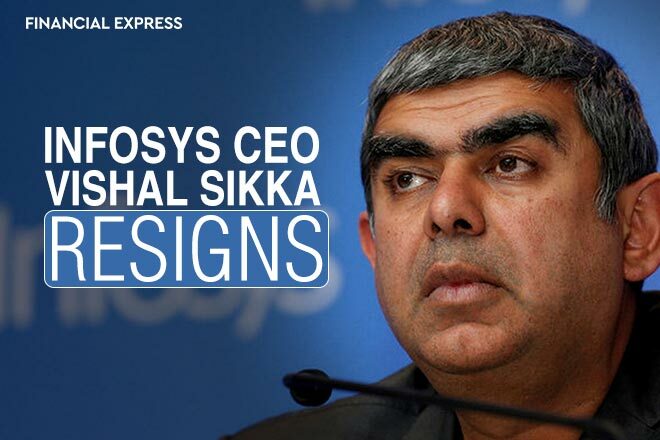 Home News Infosys CEO Vishal Sikka Resigns ? Infosys CEO Vishal Sikka Resigns ? Vishal Sikka Resigns as Infosys CEO: Vishal Sikka, the former top hand at German multinational software corporation SAP, who had taken over the reins of Infosys BSE -9.06 % in June 2014, has resigned as managing director and CEO of Infosys. The company’s board has accepted his resignation with immediate effect on Friday morning. The company said, Dr.Sikka will remain with Infosys as executive vice-chairman and will hold office until the new permanent chief executive officer and managing director takes charge, which should be no later than 31st March 2018. He will receive an annual salary of $1 during his tenure as executive vice chairman. He had just completed three years as the CEO of Infosys. Infosys has appointed chief operating officer UB Pravin Rao as interim managing director and CEO. Infosys founders, including NR Narayana Murthy, have in recent months criticised the company’s leadership over executive pay packages and for what they called lapses in corporate governance, which Vishal Sikka has stoutly denied. Infosys has been battling both internal & external challenges in terms of uncertain global economic environment and high-profile founders flagging concerns around alleged corporate governance lapses at the company.